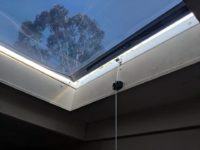 We have two ceiling skylights that get full sun and we used to put a shade mesh tarp on the roof over it during summer, but it was noisy and not a good long term solution. We now have a Reflective Blind in each and the difference is amazing! It’s so much cooler in the room and we still get plenty of light though. Thank you so much we are really happy with them. We can recommend these blinds as we have had two for more than 10 years. The blinds do what the company says they do! Reflective Blinds are an excellent product. They are highly effective in reducing heat and glare while retaining my outside views. The marketing claims are certainly not exaggerated. Recently I replaced my Reflective Blinds that I purchased in 1991 with sunscreen blinds from a reputable company. I deeply regret making the change. With these new sunscreen blinds the heat and glare have increased considerably and the ocean and harbour views are almost completely blocked out. Despite the additional cost, I intend to replace the new blinds with Reflective Blinds that over 27 years have proven to be totally satisfactory in all respects. Reflective Blinds have gone above and beyond the call of duty when supplying blinds to our Bowen Basin QLD mining projects, the speed in which our orders are processed, manufactured and shipped is second to none and they are to be commended for this. Working in such harsh and remote conditions in Central QLD it is comforting to know that you have the right product in hand while trying to complete the job right the first time. Our blinds installed have been commended by our clientele who are happy to have such a great product in their front line mining operation equipment. Just installed Reflective Blinds® in my boat. Should have got these 10 years ago!